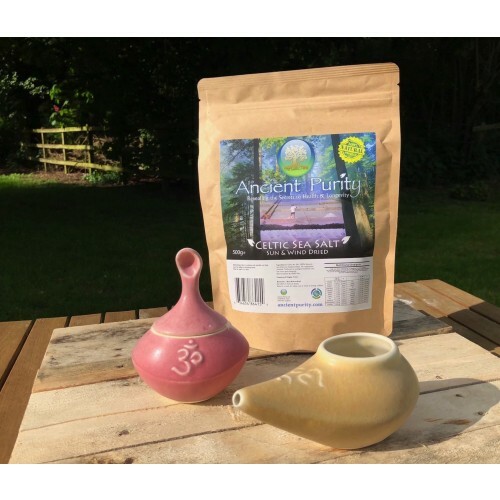 Ancient Purity have put together a beautiful health pack to cleanse your respiratory system. Keeping your nasal pathway clear and in perfect health is essential, if you live in a city, theres a huge chance your respiratory system is impaired. This also makes a great gift pack for a friend or family member living in a city. 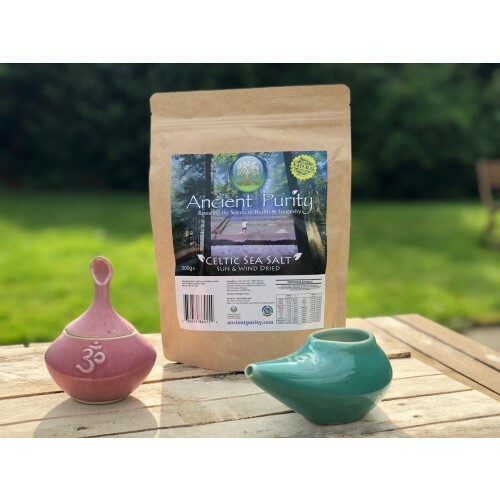 Ancient Purity presents a health pack that compliments your bathroom and allows you to keep your health in top shape, if you live or work in a city, you will be exposed to pollution. 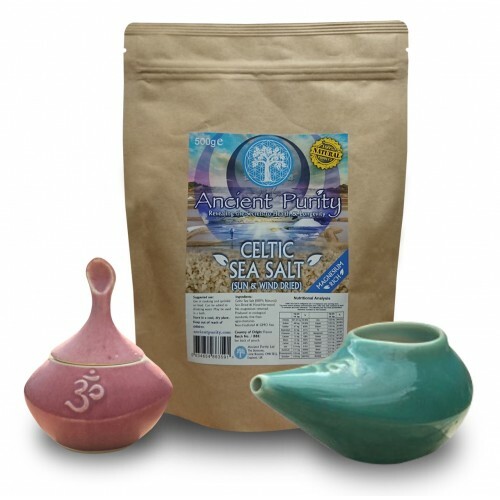 Enviromental pollution is major cause of health problems in the modern world, so to use this Ancient technique to not only clear our your nasal pathway but also enhance your good health is essential. Enjoy this artistically designed pack in your home or take on your travels, the Neti Pot and Salt jar do come in a a variety of colours, so many you'll actually need to call or email if you want specific colours, otherwise we will send you whichother colour we think will suit you, a little intuition when reading your name on the order. You may also like to have the Pack gift wrapped for an extra £5.00 this will leave the invoice out and just be emailed to you and wrapped in some attractive wrapping paper, all you need to do is select GIFT WRAPPED, and add the address of the person you're gifting it to in the shipping address. If you'd like us to add a little card with a message just email or call through to us. 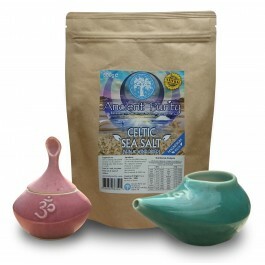 Neti pots come from a 3,000 year old health practice in India, called ayurveda. The ayurvedic system of health care recommends daily cleansing of the sinus cavity by irrigation with saline solution. Because this practice of nasal irrigation provides simple, safe and drug-free relief from colds and sinus ailments, neti pots are being rediscovered in 21st century America. Unlike some nasal irrigation devices which use pressure to introduce saline into the nasal passages, a neti pot uses gravity to allow the solution to flow gently into one nostril, through the sinus cavity and out the other nostril, simply by tipping the head slightly to one side. Unwanted nasal fluids are expelled along with the saline as it exits the lower nostril. In cases of severe congestion, the procedure may be repeated until the saline flows freely. Many people have found that the practice of nasal irrigation using a neti pot brings relief from nasal congestion due to colds or allergies, when drugs did not. Others prefer to use a mechanical means of cleansing the nasal cavity. A daily regimen helps keep the natural mucus lining of the nasal passages free of environmental impurities. The perfect Neti Pot can be cradled comfortably in the palm of the hand and is easy to wash. 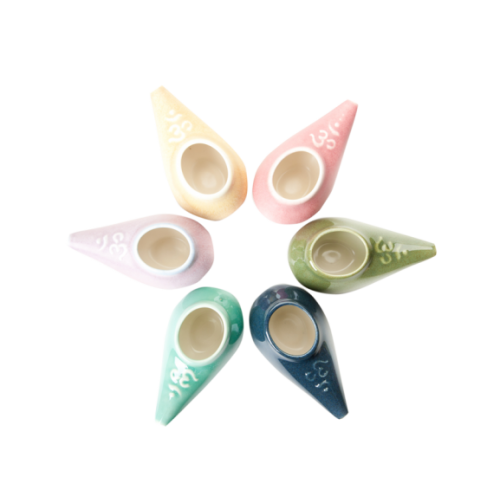 Handmade of vitrified porcelain with no internal hollows where bacteria can hide, these Neti Pots come in a range of beautiful colors to compliment any bathroom decor. Celtic Sea Salt - Produced to ecological standards, free from agro-chemicals. Non-irradiated and GMO-free. 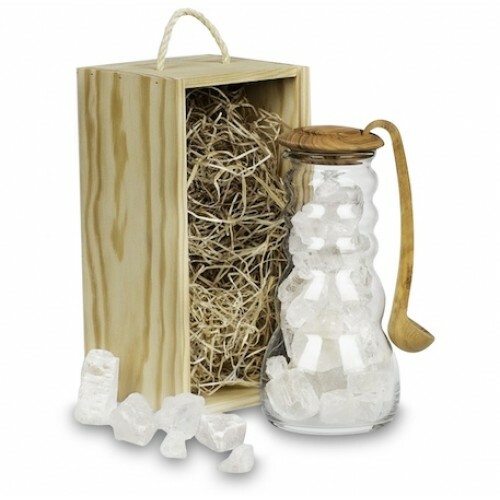 Place some of the Celtic Sea Salt into the Salt Jar. Use the measuring spoon on jar to place Salt into Neti Pot. Fill the Neti Pot with clean filtered water. Following this you are ready to perfor a Nasal Cleanse. The saline solution will flow through the right nasal passage and out the left nostril into the sink. If solution runs down into your throat, simply spit it out, and blow your nose to get rid of any mucus and excess solution. Always wash your hands before using a neti pot. Use the purest water possible: sterile, distilled, or filtered. To avoid stinging, use non-iodized salt and make sure it’s completely dissolved. Clean the neti pot thoroughly after each use with distilled or filtered water, then dry completely. Mild side effects such as nasal irritation occur in a small percentage of regular users. Users with a history of nosebleeds may want to avoid nasal irrigation. Salt Jar (Colour options available - Order by phone or email). 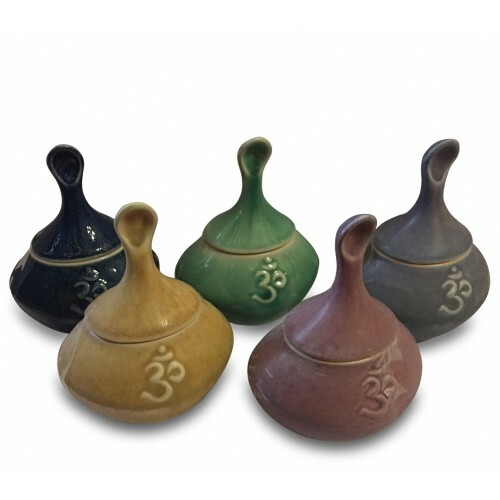 Neti Pot (Colour options available - Order by phone or email). 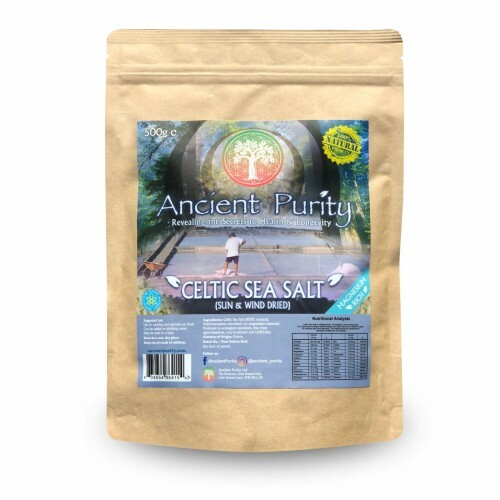 Celtic Sea Salt - 500g.